* Sydney Water, 1 Smith Street, Parramatta, NSW 2150, Australia. Most major urban water utilities in Australia have extensive critical pressure main systems, parts of which have been in service for a century or more. Failure of critical mains has severe impacts in terms of maintaining service levels to customers, loss of fire fighting supply, safety, transport disruption and other social costs, as well as significant financial and reputational implications. A better understanding of the condition, performance and prediction of failure of critical water mains was identified by an international team of partners comprising utilities, research organisations and technology providers. 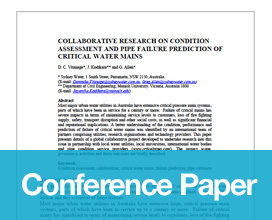 This paper presents details of a global collaborative project developed to undertake research into this issue in partnership with local water utilities, local universities, international water bodies and pipe condition service providers (www.crticalpipes.com). The project scope, governance, activities and likely outcomes are briefly described.